Chris Christie attacks the media and Jeb Bush: The New Jersey governor address CPAC. He was once the establishment candidate. Now he’ll be whatever it takes to stay in the race. New Jersey Gov. Chris Christie looks down while speaking at the Conservative Political Action Conference (CPAC) at National Harbor in Maryland, Feb. 26, 2015. Two years ago Chris Christie wasn’t invited to address the Conservative Political Action Conference. 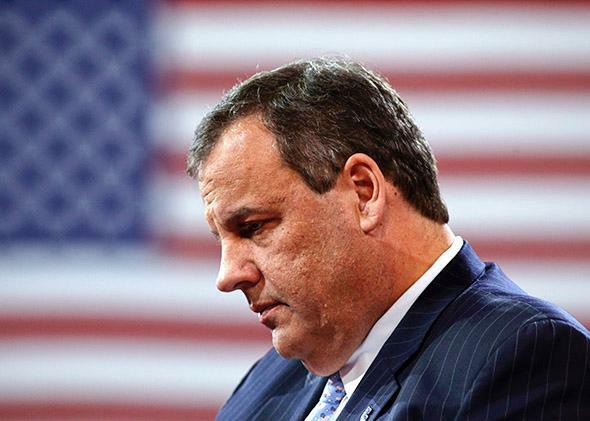 The New Jersey governor was considered too moderate and a member of the Republican establishment. This year he addressed the gathering of conservative activists and raised his profile by attacking the establishment candidate. “If the elites in Washington who make backroom deals decide who the next president is going to be, then he’s definitely going to be the front-runner,” Christie said, referring to Jeb Bush. He was responding to a question posed by talk-radio host Laura Ingraham who hasn’t always been a Christie fan. When Christie collaborated with President Obama on disaster relief after Hurricane Sandy, she said he was swooning so much it was likely he would become a Democrat. But Ingraham is also no fan of Jeb Bush, so she set up the tee and placed the ball waist high in a Thursday question-and-answer session for Christie in front of the CPAC crowd. It’s more evidence of just how much difference an election cycle can make. During the 2012 campaign, it was Christie who was invited to private meetings at exclusive establishment enclaves where prominent Republicans pleaded with him to save the party from what they thought would be a disastrous Mitt Romney campaign. Now establishment donors and wise men are showering Bush with affection and campaign contributions. Free of the burden of being the establishment’s darling, Christie also sought to exorcise his White House ties. Asked about the time he told a constituent to “sit down and shut up,” Christie didn’t shy away, saying some people needed to hear just that advice. When the audience reacted positively, he said the Obama White House needed to hear that order. The audience reacted favorably. Christie’s media strategy also seems to have evolved. For much of his early career as governor, Christie had a good relationship with the press. He was a favorite Republican of New York producers and editors in much the way Rudy Giuliani was after 9/11. When that relationship started to spoil during the fracas over the George Washington Bridge delays, Christie blamed the liberal press. He worked that theme again Thursday, echoing a strategy that Wisconsin Gov. Scott Walker has put to great effect recently. Walker has repeatedly leaned into the press corps for posing gotcha questions that reveal nothing. Ahead of CPAC, Walker penned an op-ed in USA Today saying he wasn’t going to take the media’s bait. Many of the candidates appearing on the first day of CPAC brought a rhetorical straw man on stage they could wallop repeatedly. Carly Fiorina slammed Hillary Clinton again and again. Sen. Ted Cruz did a few flying kicks into the Republican establishment dummy. Christie brought a giant New York Times punching bag. Asked about the bad press he had received—most recently over a state judge’s ruling that he had broken a law by cutting $1.57 billion from a promised payment to the pension system for public employees—Christie used the paper as a foil. “When you do things like I’ve done in New Jersey—take on special interests,” he said, “they just want to kill you.” At the end, when asked what he’d given up for Lent, the governor said he’d told his priest that he’d given up the New York Times. But his priest replied that didn’t count, because you have to give up something you’ll actually miss.